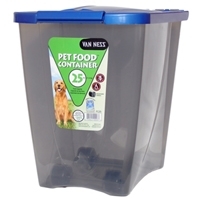 All containers feature a transparent smoke finish so food quantity is easy to track. Design sweeps on the container sidewalls and raised bullet design on the front of the container give the product a very stylish appearance. The 25 lb. and 50 lb. sizes are equipped with removable wheels for easy mobility. Convenient product nesting to maximize shelf space, Fresh-Tite-Seal keeps freshness in and moisture out, locking front latch keeps contents secure, units stack for display with lids closed, and handle grip on bottom for easy pick up.